Pike Place Special Reserve is a pre-roast blend of core Guatemala, Costa Rica coffee from the Bella Vista farm, and Colombia Narino. The Costa Rica Las Lajas was a light tangy coffee in comparison to the other two. 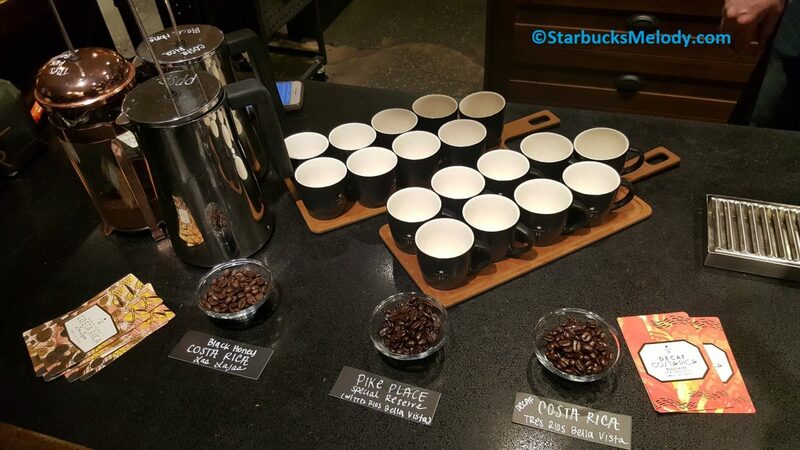 It was really great to explore three very different coffees, all of which were sourced completely from (or had a large component) Costa Rica. 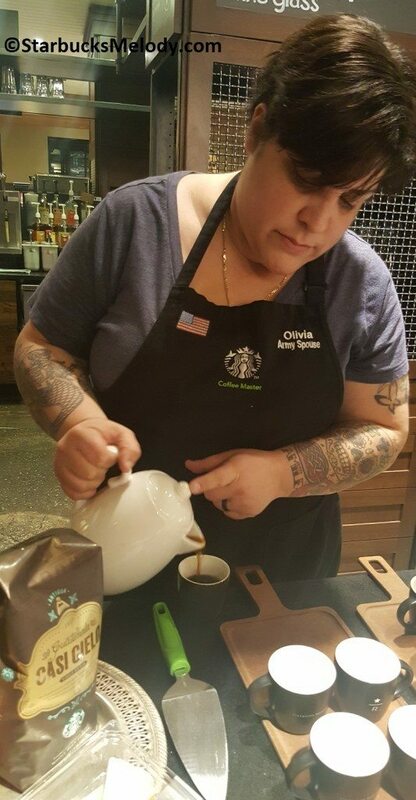 Cora is the store manager of 1912 Pike Place Starbucks and has been on an Origins trip (an Origins trip is when Starbucks selects some of their partner to go on a trip to coffee farms to experience the coffee from the perspective of the “first 10 feet”.) 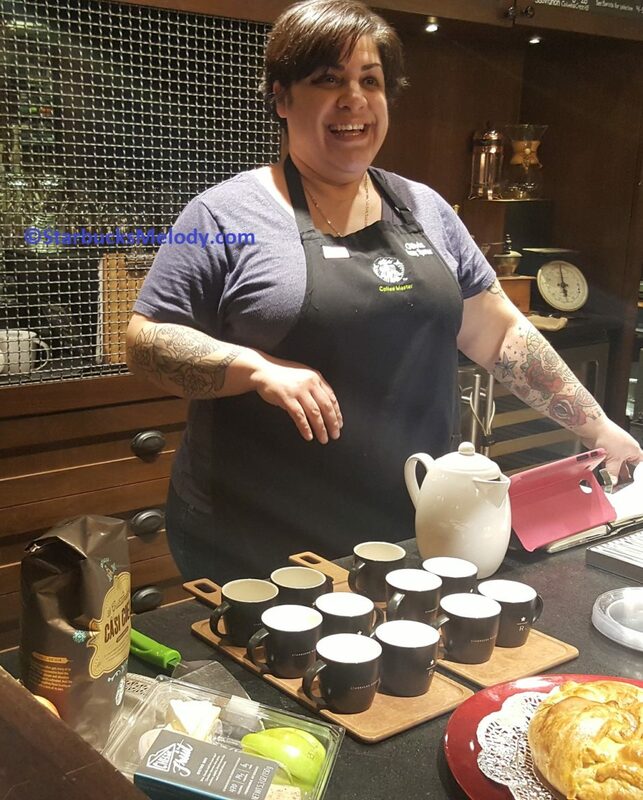 As she walked us through this coffee tasting, she showed us photos of the Bella Vista farm from her visit there and described exactly how the coffee is processed. This was a fantastic seminar. Olivia took us on adventure with Casi Cielo. She made a home-made brie and apple dessert to bring out apple notes in Casi Cielo. One aspect of Casi Cielo that isn’t well featured is that it pairs with both cheese apples. If you want to try something fun, use the Cheese and Fruit Bistro Box to bring out delicious notes in this coffee. 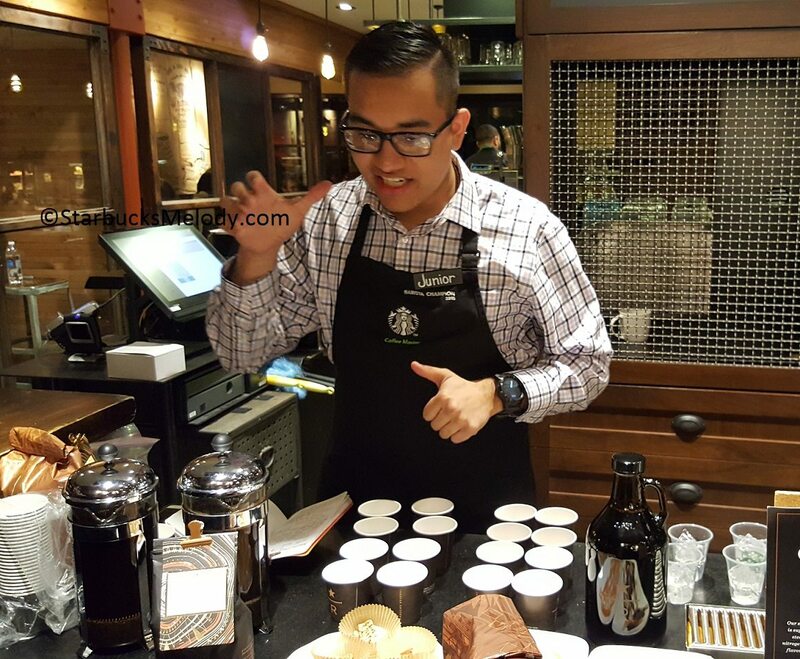 Starbucks Coffee Master Junior walked us through a coffee tasting of core Kenya both hot and made as a cold brew. 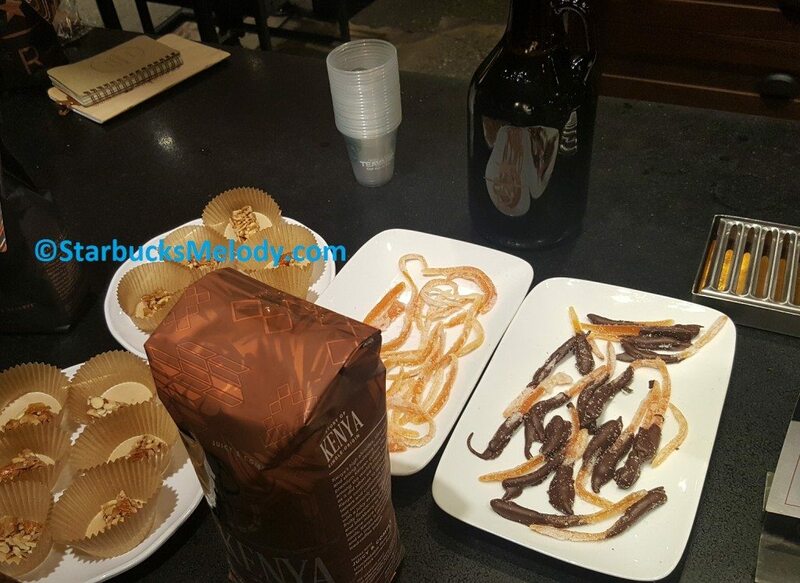 To pair with the Kenya, he made homemade candied grapefruit treat. This is the peel of a grapefruit blanched in hot water, candied with simple sugar, and dried. One half the batch had an extra step of being dunked in dark chocolate with just a dash of salt over the chocolate. This coffee tasting blew me away. 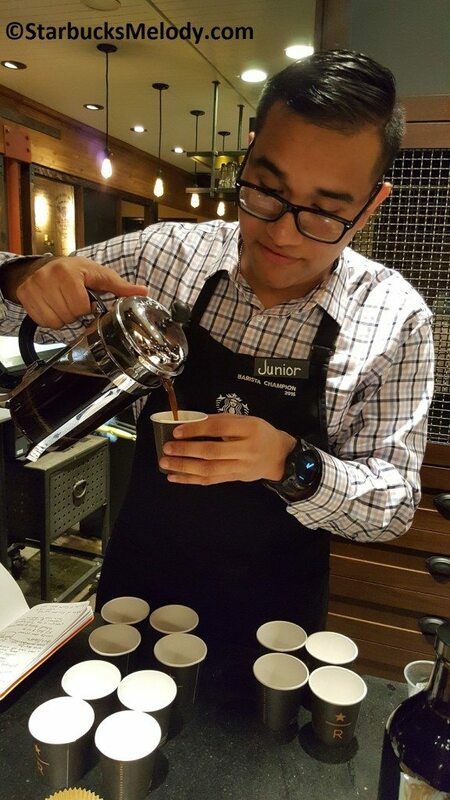 Junior demonstrated all the tangy and citrus notes of the hot Kenya with his standard candied grapefruit. The juicy complexity of this coffee popped with his grapefruit treats. Made as a cold brew, Junior demonstrated that Kenya has smoother, mellow chocoate-y notes which then came out with the chocolate covered version of his candied grapefruit. This was an outstanding A+ coffee event. 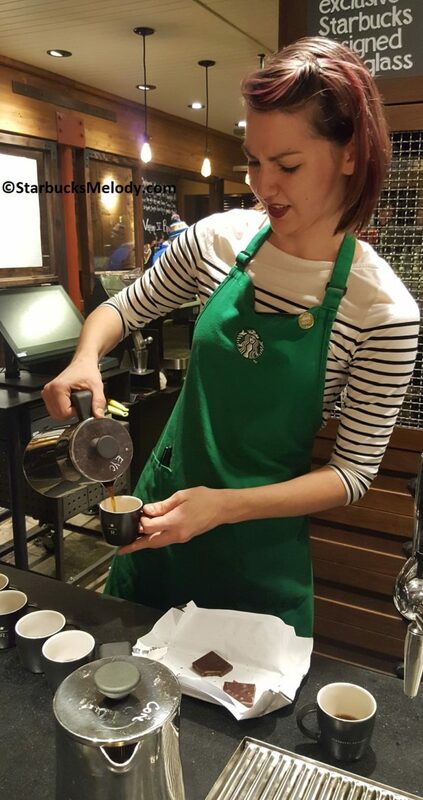 Starbucks partner Andrea had us tasting Nicaragua Maracaturra paired with spiced apple cobbler. Apples and spice pair perfectly with this coffee. 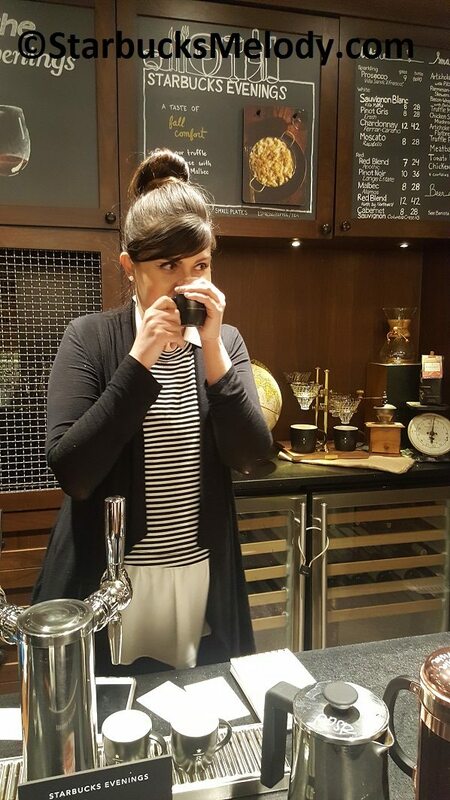 She even had us smell allspice spice before tasting the coffee to really engage all our sense: This was pretty amazing and highly effective. This is absolutely the perfect coffee for apple cobbler. I know that some people use that site to track their collection of U.S. Starbucks Reserve cards. The Brew Revolution has started at Starbucks. Christmas Reserve Blend: December 8th it arrives. I noticed you mentioned that both partners brought in “homemade” treats – is that legal? Aren’t there food safety rules about that? Wouldn’t their home kitchens have had to be inspected/licensed/etc?